Based on the ever-popular TV quiz show, Who Wants to be a Millionaire is a 6 reel, video slot from Big Time Gaming. 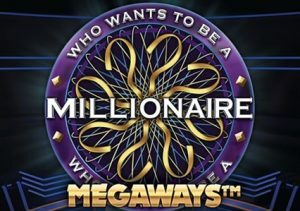 It’s played using their trademark MegaWays game engine where the number of potential ways to win can reach a massive 117,649. Winning spins results in symbol drop reactions. You can also trigger a bonus round where free spins, complete with expanding multipliers are on offer. Play on all devices from between 20p and £100 per spin. If you’ve ever seen the TV version of Who Wants to be a Millionaire, then the video slot version will have a familiar feel. The famous set forms the backdrop to the reels and you’ll hear blasts of music from the show. The reels are made up of lower value A to 9 symbols. More rewarding are the quartet of gemstones. Top of the payers is the purple jewel. Land 6 of these on adjoining reels for a 50 times bet award. There’s also a wild. The MegaWays game engine sees the number of symbols on each reel change with each spin. If they all reach their maximum, the ways to win is an enormous 117,649. Each winning combination that lands results in a ‘reaction’. Those symbols are removed and new ones replace them. These ‘reactions’ continue until no new winner is created. There’s only one feature round here but it does offer some pretty good potential. Free Spins feature – this round is activated by landing 3 or 4 scatters on the same spin. You’ll receive an initial allocation of 4 or 8 free spins but you can increase this by playing the Hot Seat Free Spins Gamble. Use your 3 lifelines (Ask The Audience, Phone A Friend and 50/50) to work your way up the ladder. The higher you get, the more free spins you’ll win. An unsuccessful gamble can result in losing all your free spins. Just like in the TV show, there are safety nets once you reach certain levels. Make rung 2 and you’ll get 10 free spins. Make it to rung 7 and you’ll get at least 20 free spins. If you make it all the way you’ll earn 50 free spins. The free spins then begin, starting at 1x. Each reaction win during the feature increases that multiplier by 1x. This doesn’t reset either, it only goes up. You can add 4 or 8 free spins to you total if you land scatters in the reel window above the main set. Rather like the TV show, the video slot version of Who Wants to be a Millionaire can deliver rich rewards. Also like the TV show, you can easily end up coming away with very little. It’s a volatile game with top payouts of 50,000 times your bet on each spin/free spin. It’s not overly flashy on the visuals front but Who Wants to be a Millionaire is a simple, playable video slot and one to consider if you like high variance action. If you like branded games, we have a dedicated Movie Slots section with the likes of The Goonies, Terminator Genisys, From Dusk Till Dawn and Jumanji available.